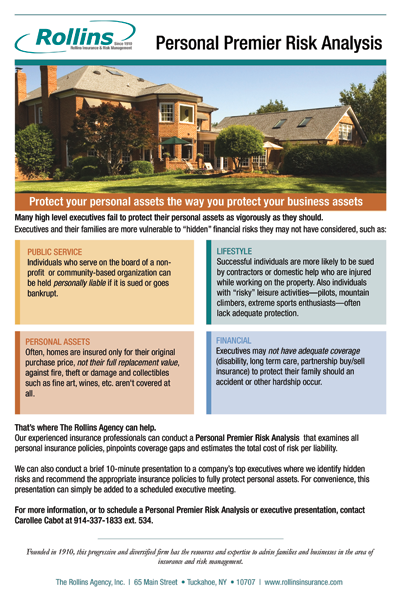 This Westchester insurance company wanted to alert high-level executives to the dangers of not adequately protecting their personal assets, but do it in a way that was both informative and compelling. Using colorful boxes and simple text, we highlighted major “hidden” risks that clients may not consider, such as serving on a nonprofit board, not insuring their fine art collectibles, or pursuing risky leisure activities such as mountain climbing or flying. This sell sheet has been used successfully by the client as a sales call leave-behind and at networking and industry events.